Our cruise on Norwegian Jewel from New York was amazing! This was the first cruise for myself and my two boys (ages 10 and 15). The ship was immaculate and the crew was great. The weather was perfect! We sailed to the Bahamas - the private island of Great Stirrup Cay was my favorite, where the snorkeling was incredible! We had a stop in Nassau where we took advantage of one of the shore excursions to Atlantis. This resort was gorgeous, but much too large to explore all it had to offer in the time-frame we were there and a bit pricey as well. We stopped at Cape Canaveral, Florida as well and took a shuttle to Cocoa Beach, but ended up going back to the ship early where we could enjoy the luxuries on board. The food was great and there were plenty of options to eat. We dined two evenings in the specialty restaurants for variety and it was well worth the investment. There were things going on every minute of the day and the entertainment on board was great! I took advantage of the spa on the ship at the start of the vacation and my oldest son even got a "heavenly massage" for teens, which he really enjoyed. He also worked out in the fitness center as well, which he loved. We all enjoyed the entire trip and it was nice to be "disconnected" from e-mail, cell phones, electronics for the week and enjoy each other. This was one family vacation we will remember! Comments for Awesome Norwegian Cruise Vacation! I am so excited to see that someone else had such a great Norwegian cruise vacation. 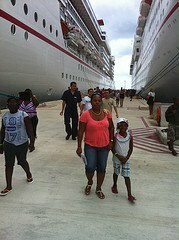 My family sailed with Norwegian Dawn to the eastern Caribbean a few years ago and a similarly great cruise. There is something about Norwegian's ships, the activities on board, the aura of "Freestyle cruising" and the presence of so many specialty restaurants that make for a fantastic vacation at sea. You did yourselves well by sailing with Norwegian, just as we did. I look forward to another Norwegian cruise vacation soon. By the way, Norwegian has two new ships hitting the waters in 2013 - the Norwegian Breakaway and in 2014 - the Norwegian Getaway. The reports are that these new Norwegian ships are sure to amaze. You may get hooked on cruising, as much as my family has. Join in and write your own page! It's easy to do. How? 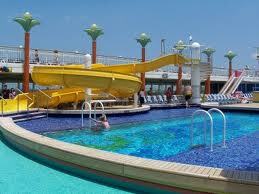 Simply click here to return to Norwegian Cruise Reviews.